Located close to the tourist centre of Kusadasi, the Happy Apartments are well situated in a quite area just a short walk from the famous Ladies Beach, making them an ideal choice for anyone looking for a relaxing holiday with all you need close by. Along the beach you can also find a long promenade where there are a great variety of restaurants and bars to explore and you do not have to go far to do and see even more with all sorts of attractions from shops to waterparks not far away.These charming 3-star family-run apartments are designed with comfort and relaxation in mind, with its range of spacious apartment style rooms and modern features that have been improved since its renovation in 2006. One of these apartments best features is its large outdoor pool, which features a swim-up bar, the perfect place to enjoy the sun while not at the beach whether on the terrace or in the pool. There is also a restaurant/snack bar for when you donâ€™t feel like visiting one of the many restaurants along the promenade and even more services available at the apartments include laundry facilities, all of which are aimed to help you enjoy your stay. If you are looking for spacious and comfortable accommodation in Kusadasi, right by the beach, then you will find the Happy Apartments would be an excellent choice, with its spacious self-catering apartments rooms and all the facilities needed to help you relax. 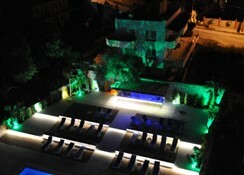 The apartments feature a large outdoor swimming pool, which the complex is built around. 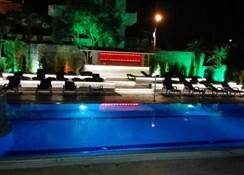 The pool includes a separate section for children and there is also a swim-up bar so you donâ€™t even have to go far to find a refreshing drink. 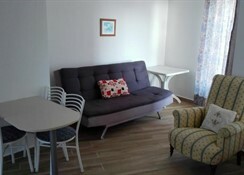 The accommodation at the Happy Apartments consists of spacious one-bedroom apartments suitable for up to 4 people. The apartments are simple yet brightly furnished and feature a open-plan living/kitchen area, separate bedrooms with twin beds and a separate bathroom. 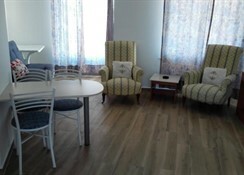 All the apartments also include: air conditioning (local charge) â€“ shower â€“ WC â€“ satellite TV â€“ telephone â€“ separate double bed/sofa bed â€“ hairdryer â€“ safe (local charge) â€“ tea/coffee maker â€“ fridge â€“ cooking hobs. The restaurant at the hotel provides a complimentary breakfast buffet of local and international dishes each morning. For lunch and dinner there is a set menu to choose from or you can choose from the a-la-carte option. 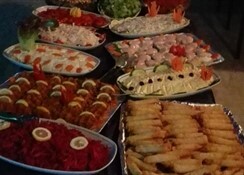 Special dishes can also be prepared on request. Situated a short walk from the heart of Kusadasi, the hotel faces out onto the magnificent Ladies Beach. Here you can sunbathe, swim in the clear blue waters, or if youâ€™re feeling a little more energetic, engage in a number of exciting water sports.Kusadasi is one of the most sophisticated resorts in Turkey, and is famous for its many traditional fish restaurants. Head into the resort to find shopping facilities, bars and markets, not to mention a lively nightlife!Other sites of interest in the surrounding area include Priene, Pergamum, Aphrodisias and the ancient city of Ephesus, which boast a number of important historical sites.